Most of the time honey bees are not aggressive like yellow jackets and hornets. Occasionally however, I have gotten jobs where the bees were so mean, that it made for a very difficult removal. If the home owner has been stung by the bees, I can usually guess that it is going to be a feisty hive to deal with. This was the case for a job I did in Montgomery, Alabama. The colony was an older colony that had been there for some time. I have found that older colonies are typically more defensive than relatively new honey bee colonies. I am not really sure why this is. I think it could have to do with the hive being larger and more established. 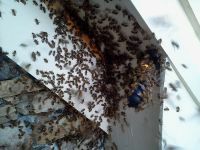 As soon as I began cutting the soffit, in this Montgomery home, the bees were all over me. You can see from the picture the bees going crazy. I don't remember how many times I was stung at this job, but I am sure it was dozens! As I removed more and more of the honey bee colony, the bees began to somewhat calm down. It turned out to be a large colony with a decent amount of honey. In this particular removal, there was also a dead section of bees that had thousands of hive beetle and wax moth larva crawling through it. Honey was even dripping down the side of the house. My guess is that, this was the result of the home owner attempting to solve the bee problem but was unsuccessful. The bees just moved over to a new section and were able to thrive there. Southeast Bee Removal did a thorough job of removing the entire honey bee colony, mess and all. The piece of wood soffit was put back on the eave of the house and everything was sealed up to keep the bees from ever being able to come back to that same spot. Southeast Bee Removal is a professional bee removal company specializing in the live removal and relocation of honeybees. Areas serviced include: Montgomery, Prattville, Millbrook, Tuskegee, Wetumpka, Union Springs, Greenville, Selma, Pike Rd, Mt. Meigs, and the surrounding areas. For a free bee removal estimate give us a call today. We look forward to serving you!